Ultimately, camping is just an excuse to drink in a novel environment and use expensive, specialized equipment. 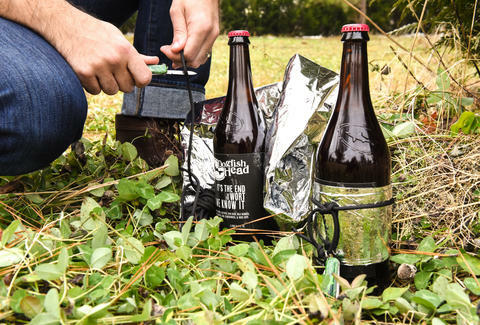 If you're looking to participate in that age-old rite, you better get your hands on the new "survivalist" beer from Delaware's Dogfish Head Brewing, which comes with a knife, rope, and blanket, a bunch of nutrients, and a 9% ABV. The Belgian-style fruit ale is appropriately named "It's The End of the Wort as We Know It" and will get an ultra-limited release on January 27 at 11am. The 750ml bottles will only be available at Dogfish Head's Milton brewery in Delaware, so maybe make a camping trip out of it. It'll be waiting for you with a special-edition Dogfish-branded Swiss army knife tied to the neck, a solar blanket wrapped around it, and a length of paracord securing the blanket. As to what this survivalist beer is actually like, it's full of essential amino acids, micronutrients, and vitamins and "made from a complex mix of nutrient-packed super foods." The brewery describes it as tart and sweet with "jammy blueberry, cranberry and cherry flavors," and it's made with a mixture of blueberries, acai, and goji berries, plus ingredients like purple sweet potatoes, rose hips, chia seeds, flax seed, spelt, oats, and quinoa. If you're looking to get your calloused, woodsy hands on it, one 750ml bottle will run you $45. Only two of the 200 available will be allowed per person. The Milton, Delaware brewery will also have it on tap while supplies last, but with only be two sixtels worth, that won't be long. So make a trip out of it: You'll definitely have supplies for the way home. James Chrisman is a News Writer at Thrillist who is the opposite of a survivalist. Send news tips to news@thrillist.com and follow him on Twitter @james_chrisman2.